U.S. DJ/producer and two-time Grammy Nominee Morgan Page recently announced his biggest ever tour - Morgan Page Presents Tour. This is Morgan’s first official tour following the “In the Air” tour that included over 35 sold out shows, resulted in Sirius XM inviting Morgan to host his own weekly show and drove over 500,000 digital tracks sales in the US and Canada alone. 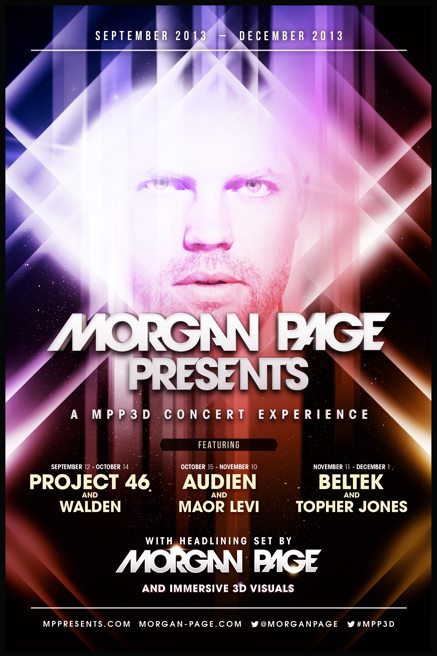 Morgan Page Presents Tour will bring Morgan’s performances to over 50 US and Canadian cities and will feature a revolving roster of handpicked developing talent from around the world. Special guests on select dates include Audien (USA), Beltek (Slovenia), Maor Levi (Israel), Project 46 (Canada), Topher Jones (USA) and Walden (Australia). Morgan will be incorporating a new 3D interactive element originally created for Michael Jackson's "This Is It" that will be revealed for the first time on this tour. Immersive environments of 3D light and colour will literally envelope Morgan and the crowd in a sensory experience.